This week was much better for us. I started the week with a freshly organized desk and some work prepared for the week. I thought out those things I would like Mason to accomplish and had them ready Sunday evening. This worked out well for me, so I may begin to try Sunday evenings as my planning time. As a part of math this week, we worked on identifying and naming 3-dimensional objects. I found a good set of printable 3-D flashcards at mrprintables.com. I introduced these cards a few weeks back. This week Mason took each card and went around the house to find objects to match the shape. We fudged a little on the pyramid item (pizza slice). It turned out really difficult to find a true pyramid! After collecting all the different objects, Mason then went on to build a “sculpture”. This was great because after completing his creation, he told me about it by identifying the names of each of the elements. For example, instead of saying here is the paint bottle, he said – here is the cylinder, cube, etc. This was a very fun way to practice naming 3-dimensional objects. It was also challenging to find items from around the house. I had fun helping with this. This is the activity described above. 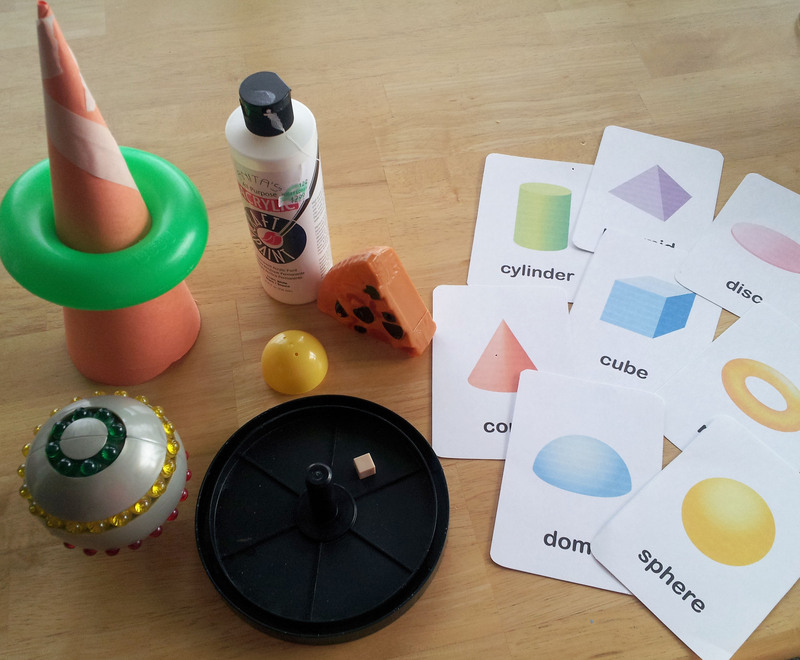 Review 3-D flashcards and then find objects in the house that are those 3-D shapes. Add some fun by then taking the 3-D items and make a “sculpture” from them. Then name each item in the sculpture using the 3-D shape name. Page 11 & 18, in the All About Fall pack from servingjoyfully.com, are two cute trace and color sheets. Madison enjoyed the sheets as well! 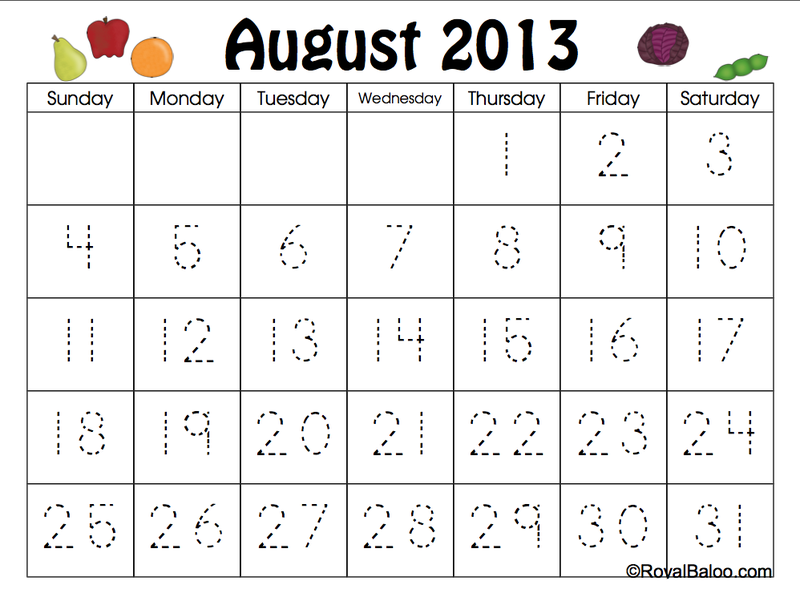 The preschool calendar notebook pages from RoyalBaloo.com are a great set of printables. We are not good at tracing the date each day. Mason tends to enjoy doing them more than one at a time. He went back to them this week, finishing the numbers for all of September and most of October. 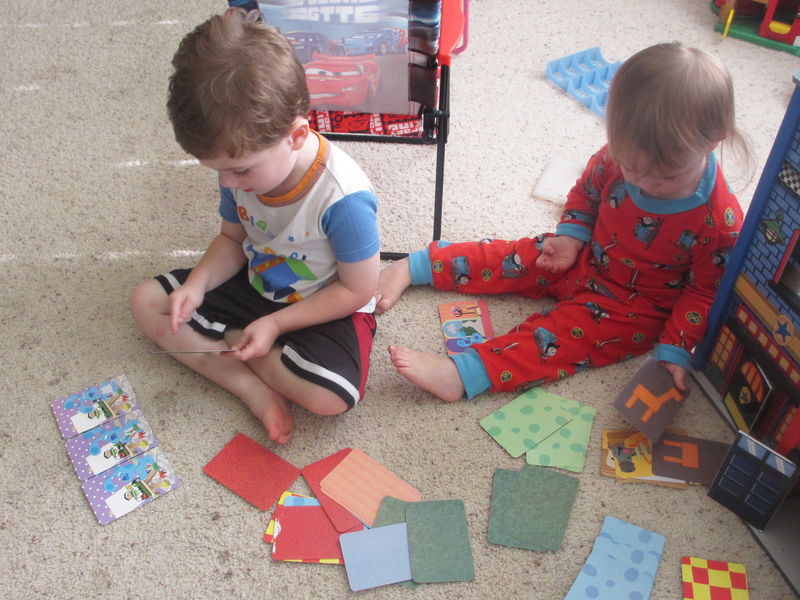 Using a set of Blue’s Clues story sequencing cards, four cards are given and must be placed in correct story sequence by looking at the scene on the card. This is helpful not only to see if a child can recognize a storytelling sequence, but also to see if left to right reading is occurring. 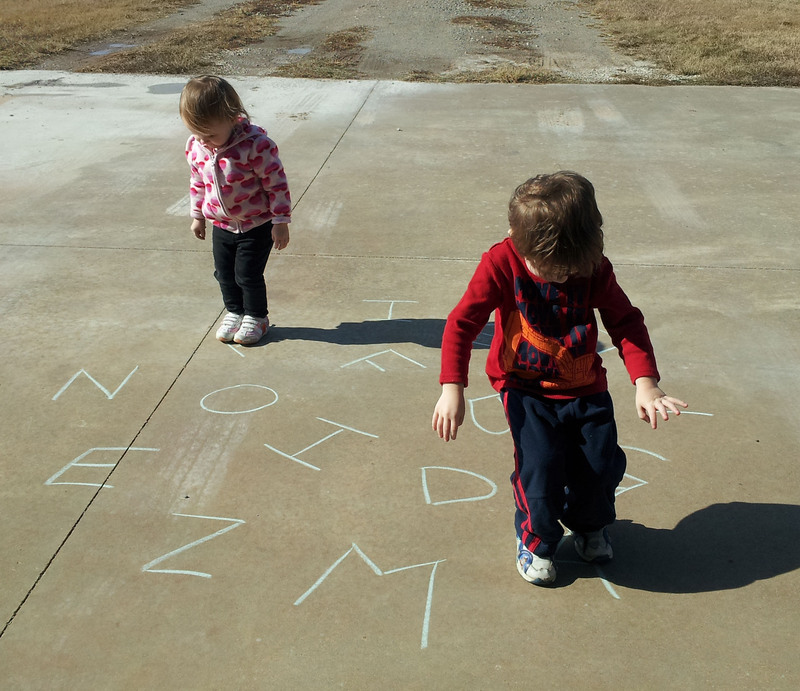 For this activity, letters are written in chalk on the driveway. I chose letters that pertained to three or four word families we had been working on, as well as letters for Mason’s name and a few other sight words. Then I give a word and Mason jumps on the letters to spell that word. After a while, Mason likes to choose the words and spell them. 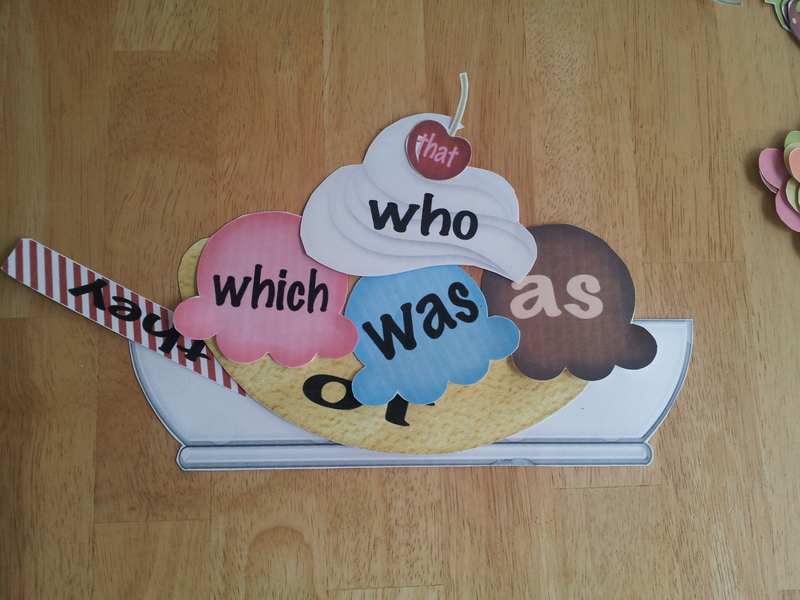 This is a cute printable that gives another fun way to practice sight words. Normally, Mason would build his own Sight Word Sundae and say the words as we take it apart. Lately Mason hasn’t wanted to build a sundae, but if I build one he will read the words from mine. Works for me! It has become blatantly obvious to me that I need to make a conscious effort in the area of organization. We are 5 months into our learning at home journey and I can begin to feel a shift from “something we are trying out” to “let’s do this thing”! 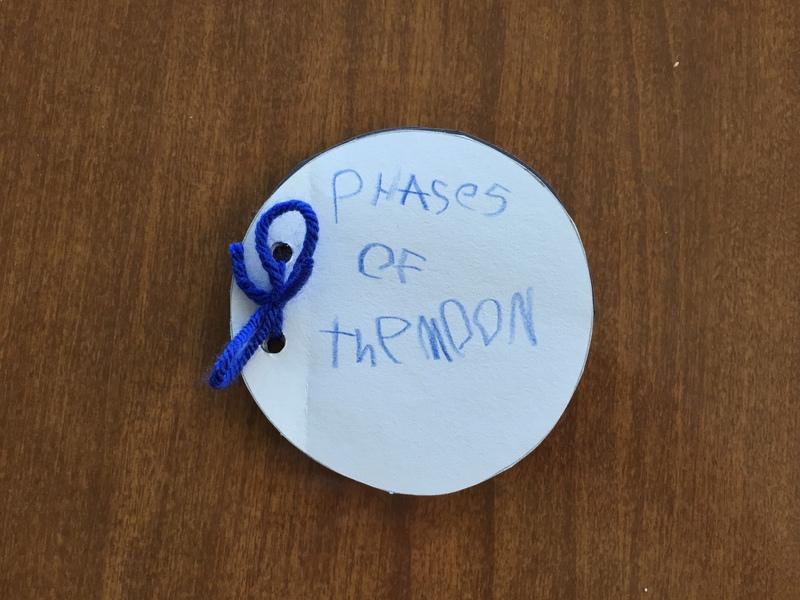 Our learning year is from June to June, and I can feel that when Mason turns 5 years old (in June) that we will begin to move things to a new/next level. A few more structured activities, a few more activities during the week, as well as a few more activities that Mason does more independently. All of these things are wonderful and I am whole-heartedly looking forward to them. What I am seeing now is the need to find our path of organization. To be honest, it’s a little overwhelming. When teaching public school, I had a whole classroom in which to organize work, manipulatives, supplies, etc. Granted, I had many more students, but still. We do not have any extra rooms, or much extra space in our home to use as a “school room”, not that I would be likely to do that anyway. I know it will work. I know there is a way. I need to remember that I am creative, and that this can be done. I also want to do this without spending an outrageous amount of funding on organizational items. I will keep you posted (quite literally!) on how we obtain our organizational haven. If you have walked this path and have ideas to offer – please feel free to comment below! Several weeks ago, the concept of “take away” was introduced through Freddy the Front Loader, a learning activity found in the Lego Pack from walkingbytheway.com. This introduced the concept of subtraction, so this week I decided to move into connecting the symbolic numbers with the concept. 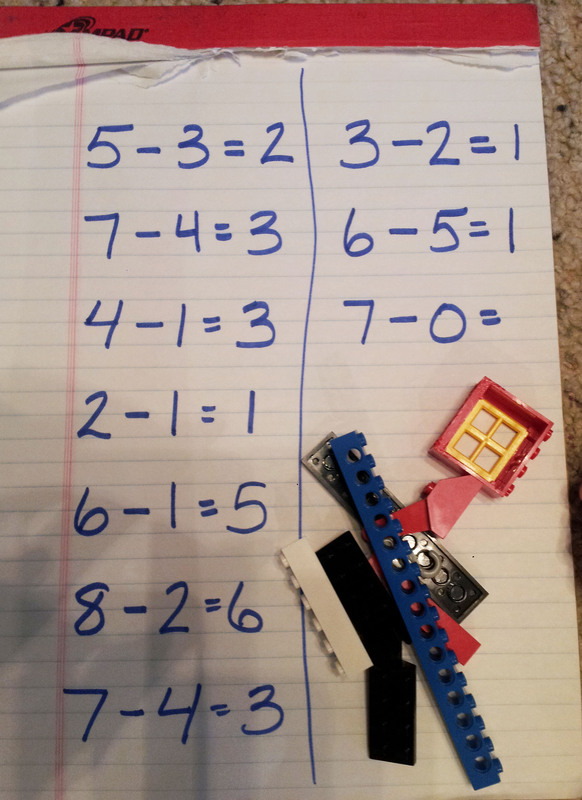 I wrote a subtraction problem and we did the first two or three together. Toward the end, Mason starting making his own problems. This, as it always does, leads to the discussion of what happens when a larger number is taken away from a smaller number. I refuse to tell students “this can’t be done”. We had a conversation that if we take a larger number from a smaller number we don’t have enough! In the coming years, this gives a foundation on which to build the concept of negative numbers. While sitting at my desk, Mason found one of the die from the Fourth of July pack at 3 Dinosaurs. He asked if he could do it. I didn’t feel like finding it on my computer, printing it out, etc. 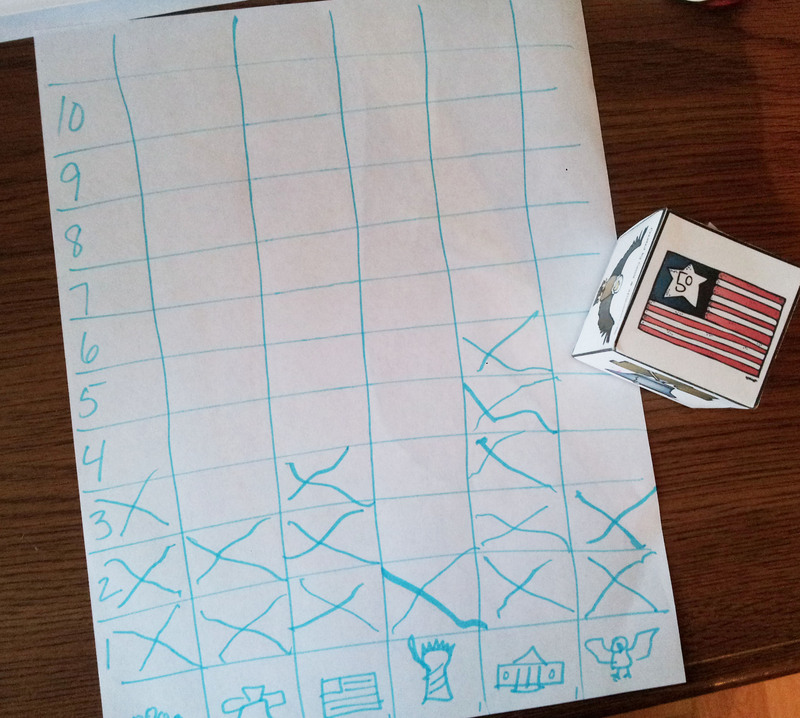 So, I quickly sketched pictures at the bottom to match the pics on the die and Mason set to rolling and graphing. Gotta’ love the impromptu practice! Page 9, in the All About Fall pack from servingjoyfully.com, is a cut-and-paste Fall tree. My plan was to use this activity as an informal assessment on what Mason knew about the Fall season characteristics. While he was creating his tree, I asked him what he knew about the season of Fall. I made sure to not give him any prompts besides, “What else?”. I wanted to know what he had truly internalized about Autumn, not what I could trigger in his memory. 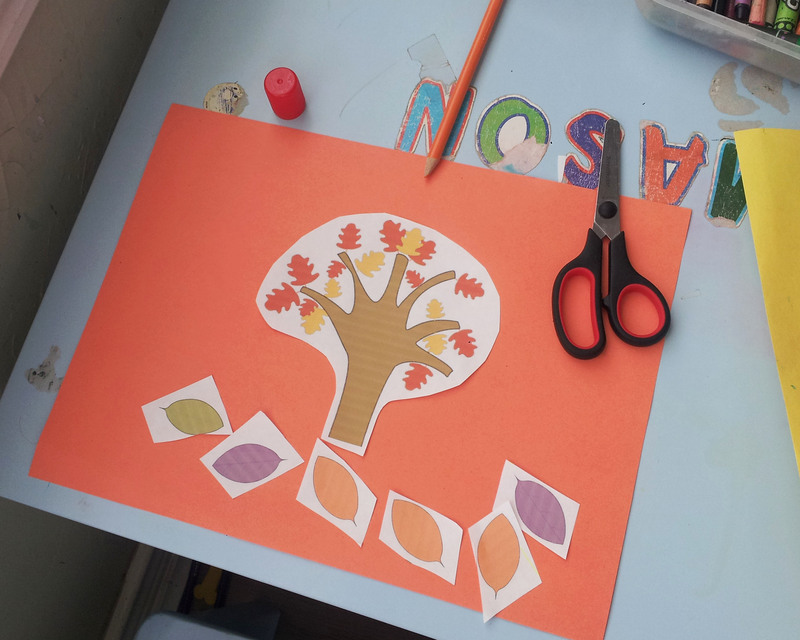 After creating the tree, we used Page 10 in the pack to graph the different color of leaves that had fallen from the tree. 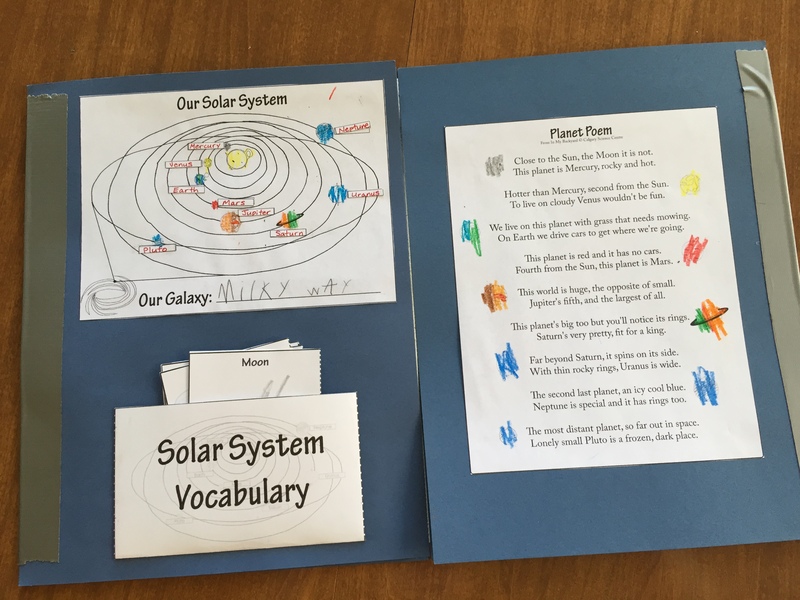 A great activity to blend science, informal assessment, math, arts-and-crafts, and cut-and-paste for fine motor skills. 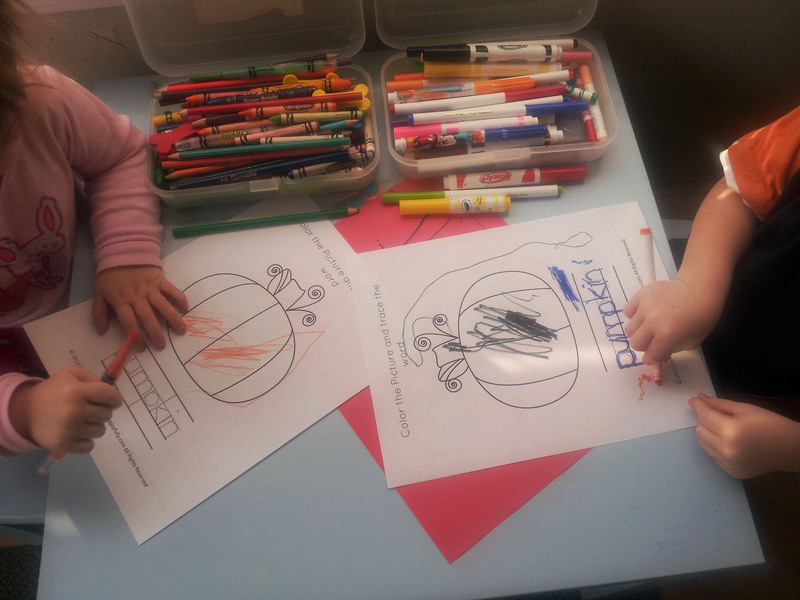 Another big thumbs up on this 20 minute activity! We did a little acrylic paints on canvas boards and threw in some extra tools such as forks to experiment with texture. Mason put tape on his canvas before painting so that it would create a fun design after the paint dried and we peeled off the tape. 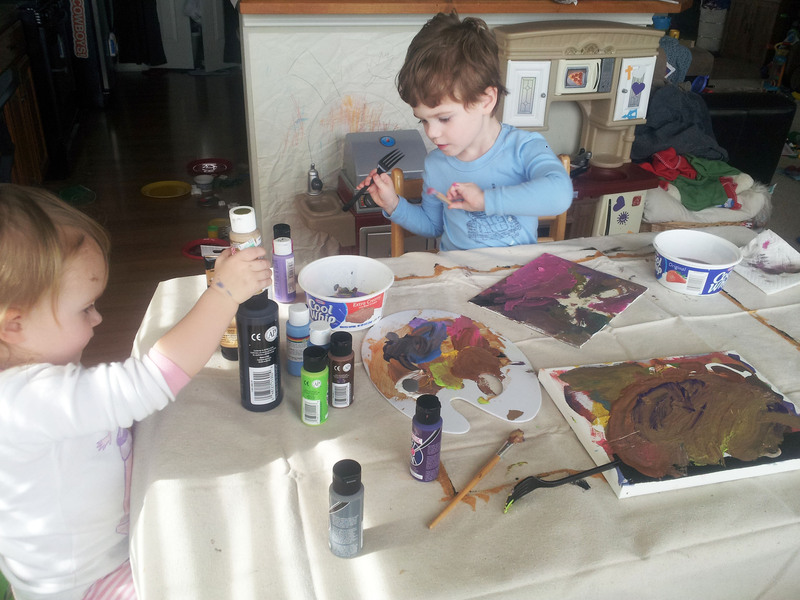 Madison was simply more interested in getting as much color on her canvas as possible. She also decided that playing with the bottles of paint was just as fun!